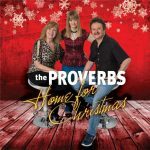 “Home For Christmas” is the latest of 27 albums (and the 2nd full length Christmas project release) by the Canadian gospel group, the Proverbs, which is comprised of husband and wife Dave and Kathy Daw, along with their youngest daughter Natasha. This project follows on the success of 2 previous Proverbs albums which were both was nominated as "Album of the Year" in the 2015 and 2018 "Covenant Awards" by GMA Canada. "Home for Christmas" features 11 great new Christmas songs with musical variety from jazz to county, southern gospel and beyond. Be sure to add both "Home For Christmas" and the previous Proverbs Christmas album, "Christmas Our Favourite Time of Year" to your Christmas music library.